Last week I was tasked with developing a quick prototype that used AngularJS for its client and Spring MVC for its server. A colleague developed the same application using Backbone.js and Spring MVC. At first, I considered using my boot-ionic project as a starting point. Then I realized I didn't need to develop a native mobile app, but rather a responsive web app. My colleague mentioned he was going to use RESThub as his starting point, so I figured I'd use JHipster as mine. We allocated a day to get our environments setup with the tools we needed, then timeboxed our first feature spike to four hours. My first experience with JHipster failed the 10-minute test. I spent a lot of time flailing about with various "npm" and "yo" commands, getting permissions issues along the way. After getting thinks to work with some sudo action, I figured I'd try its Docker development environment. This experience was no better. JHipster seems like a nice project, so I figured I'd try to find the causes of my issues. This article is designed to save you the pain I had. If you'd rather just see the steps to get up and running quickly, skip to the summary. Once I had a fresh version of Node.js, I was able to run JHipster's local installation instructions. In other words, I'd recommend using Java 7 + (cookie-based authentication with websockets) or (oauth2 authentication w/o websockets). After creating my project, I was able to run it using "mvn spring-boot:run" and view it at http://localhost:8080. To get hot-reloading for the client, I ran "grunt server" and opened my browser to http://localhost:9000. I had no luck getting the Docker instructions to work initially. I spent a couple hours on it, then gave up. A couple of days ago, I decided to give it another good ol' college-try. To make sure I figured out everything from scratch, I started by removing Docker. After doing some research, I learned I needed to run boot2docker init first. Next I ran boot2docker up to start the Docker daemon. Then I copied/pasted "export DOCKER_HOST=tcp://192.168.59.103:2375" into my console and tried to run docker pull again. It failed with the same error. The solution was simpler than you might think: don't use sudo. VBoxManage modifyvm "boot2docker-vm" --natpf1 "containerssh,tcp,,4022,,4022"
VBoxManage modifyvm "boot2docker-vm" --natpf1 "containertomcat,tcp,,8080,,8080"
VBoxManage modifyvm "boot2docker-vm" --natpf1 "containergruntserver,tcp,,9000,,9000"
VBoxManage modifyvm "boot2docker-vm" --natpf1 "containergruntreload,tcp,,35729,,35729"
After making these changes, I was able to start the image and ssh into it. 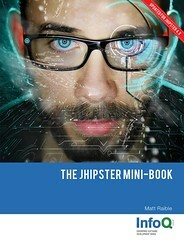 The fix was giving the "jhipster" user ownership of the directory. However, I was puzzled to see that there was nothing in my ~/jhipster directory. After doing some searching, I found that the docker run -v /host/path:/container/path doesn't work on OS X.
David Gageot's A Better Boot2Docker on OSX led me to svendowideit/samba, which solved this problem. The specifics are documented in boot2docker's folder sharing section. I started the JHipster container without the -v parameter, used "docker ps" to find its name (backstabbing_galileo in this case), then used that to add samba support. After doing this, all the files were marked as read-only. To fix, I ran "chmod -R 777 ." in the directory on the server. I noticed that this also worked if I ran it from my Mac's terminal, but it took quite a while to traverse all the files. I noticed a similar delay when loading the project into IntelliJ. Phew! That's a lot of information that can be condensed down into four JHipster + Docker on OS X tips. Make sure your npm installation doesn't require sudo rights. If it does, reinstall using nvm. Add portmaps to your VM to expose ports 4022, 8080, 9000 and 35729 to your host. Change ownership on the /jhipster in the Docker image: sudo chown jhipster /jhipster. Use svendowideit/samba to share your VM's directories with OS X. Since you had issues, I don't feel so bad. :) I tried it on Windows. To me, all the node and bower and etc is just to too much. I am just using JHipster for examples on how to use different things and to learn from. I'd rather use the WebJars like you did in your ionic project (well i think you did). Once you got everything up and running, which starting point did you end up using for the project? boot-ionic, RESThub, or JHipster. Did you find any to stand out as bing more productive than the others? Ryan - that decision is still pending. I doubt it'll be boot-ionic since we have no current needs for a native mobile app. Next week, my colleague will give an architectural review of his RESThub implementation and I'll give an overview of my JHipster version. Then we'll let the team decide from there. I'll try and update this post after that decision. But JHipster is really a great platform to start a new project. 10 years ago, I was a BIG fan of AppFuse, putting together stuff like Spring, Hibernate, JUnit and XDoclet. I have the same feeling with JHipster mixing JS stuff with Spring boot and giving the right path for making this happen. Good news! The JHipster team has updated their documentation to include these issues. Thanks guys! After you create your project in JHipster with initial entities, how do you go about defining a different landing page and login dialogues than the built in JHipster page? I guess, how to move on after the initial successful launch? Dhafir - it's best to post JHipster-related questions to Stack Overflow. If you use the jhipster tag, you'll likely get the answer you're looking for.